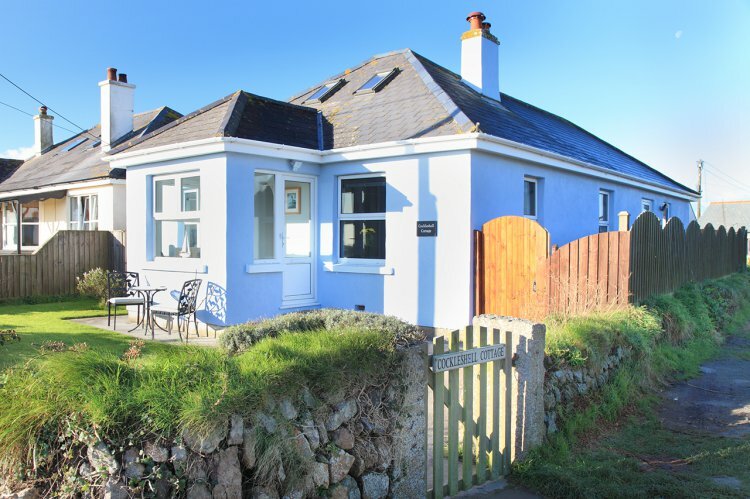 'Cockleshell Cottage' is a three bed two bath bungalow close to the centre of Lizard village but just out of the summer hustle and bustle. From the front door there's easy access to the pubs, cafes and shops in the centre of Lizard village which is just a 200metre walk away. Walking a little further takes you to the Lizard Lighthouse and most Southerly Point where you can pick up the coastal footpath for more distant walks to the fishing village of Cadgwith or in the other direction, the beach at Kynance Cove. The property is accessed via a step up into a good size porch which is tiled and ideal for coats and boots etc. from here on it's all on one level with a central corridor leading to all rooms. The living room on your right has two three seat sofas and a recliner chair, with a wall mounted smart TV and a wood burner below to make a cosy night in. On the left is the first of 3 bedrooms, each contain a hairdryer. This double room overlooks the front garden, with bedside table and lamps, chest of draws, TV with Freeview and a large built-in wardrobe. Next on your right is the twin room, with bedside tables and lamps, and a curtained storage area with clothes rail. Opposite on your left is the second double room, with bed side tables, built in wardrobe and large chest of draws. For cooking and dining, the kitchen is fully equipped with a double oven with induction hob above, dishwasher, 4 slice toaster, kettle, breakfast bar with two bar stools and the dining area has a table with six chairs and a wall mounted TV. From the dining area there’s a backdoor to the enclosed rear garden. Also off the kitchen is a utility room with a washing machine tumble dryer and the fridge freezer. Opposite the kitchen is the shower room with toilet and hand basin and a further separate bathroom with toilet, hand basin and heated towel rail. Outside there is an enclosed rear parking space and garden with garden furniture and a charcoal BBQ. The front garden has partial sea views from the property over the hedge rows - see pictures! Rental includes WiFi, bedlinen, towels, electricity and heating by electric panel heaters. Up to two well-behaved dogs will be accepted by prior arrangement at £25 per dog per week.